He’s the friendliest ghost you know. No, not Patrick Swayze – Casper, The Friendly Ghost. Though grownups might / Look at him with fright / The children all love him so. 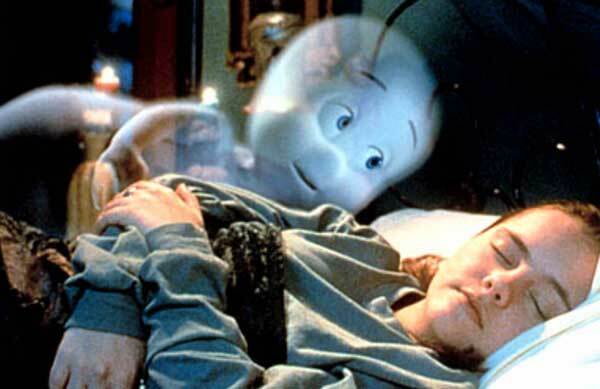 After innumerable comics, television shows and theater shorts, Casper makes the spirited leap to full-length feature film in CASPER, a live-action adventure melded with excellent 3D animation. 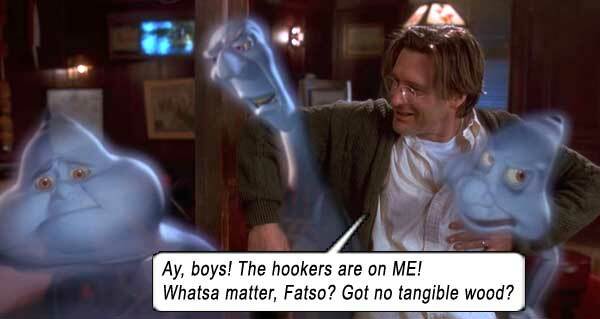 Bill Pullman is Dr. Harvey, a paranormal expert, hired by Cathy Moriarty to exorcise a mansion she has just inherited. Dr. Harvey and his teen-demographic daughter Kat (Christina Ricci) move in, and soon discover three mischievous ghosts – The Ghostly Trio: Stretch, Stinkie and Fatso (voiced by Joe Nipote, Joe Alaskey and Brad Garrett), and their round-headed nephew Casper (voiced by Malachi Pearson), who wants to be their pal. The ghost effects are very well realized: they are three-dimensional yet see-through, and the filmmakers have captured well the form and personality of the Ghostly Trio; they’ve even found a perfect effeminate yet not-gay voice for Casper, and – like SPIDER-MAN – his head roundness is Just Right. Hijinks ensue, with lots of slapstick, lightning-fast sight gags, and questionable eye-lines. Ricci and Pullman (and other humans, whom the ghosts call “fleshies”) are really onscreen, but all the ghosts are CGI, while the physical environment (curtains, doors, bedposts, paintings, food, glass, etc.) is a combination of CGI and practical effects. It’s an entertaining diversion, and should keep the kiddie demo happy through your afternoon nap. The funniest sequence by far is a cannonade of cameos, when Pullman looks into a mirror and sees – Clint Eastwood looking back (who satirizes his recent UNFORGIVEN by threatening, “I’m gonna kill you, your mama, and all her bridge-playin’ friends!”), who morphs into Rodney Dangerfield wisecracking, and then into Mel Gibson, who says nothing, just admires his pretty mug. Not all the cameos are commendable, as Eric Idle makes a fool of himself in a small role; it’s nowhere near horrible, but it’s nowhere near Python. If you contemplate some of the life/death events here, you realize how morbid this topic can be for youngsters. (Or maybe the movie is suggesting that now might be a good time to talk to your kids about grandma’s imminent demise?…) Cathy Moriarty dies and comes back as a ghost, until she is tricked into “crossing over” to the other side. “What is ‘other side’?” ask the muslim children. Then Dr. Harvey dies, comes back as a cartoony ghost, and is resurrected by Casper’s Lazarus Machine, which he was going to use to turn himself into a real boy to touch Kat in that way. That’s downright horrifying! Where’s his physical body going to come from? The grave? Decomposed and worm-ridden? I mean, we’re talking zombies here, mormon children! I guess it’s no more horrifying than the story of Jesus, the second resurrected christian zombie (after the actual Lazarus). Dr. Harvey’s dead wife (Amy Brenneman) also visits as a ghost in the finale. (We wonder why she appears in human form, and not cartoony, like every other ghost. Oh, it’s because she’s an angel! “That’s how we want grandma to be!” chime the evangelical children. What are the rules again? Don’t have any. Uh, okay, onward.) For sacrificing his chance to be alive by resurrecting Dr. Harvey, his wife grants Casper the wish to be human – only until ten o’clock. It’s a gruesome fate, probably more painful than not turning real at all. And then Casper blows it by getting just one timid kiss in. A more suitable denouement might have been: let Dr. Harvey remain dead! He could have been with his wife! Then Casper could have become a real boy, as he and Kat have their lives ahead of them. It’s win-win! By now there’s so much living and dying going on, I’ve lost track of the zombie-muslim-scientology-pagan message. I guess they wanted to meld Pinocchio and Cinderella, and then make sure there was a curfew, so that all good teen ghosts tuck it back in their sheets. Writers: Joseph Oriolo, Sherri Stoner, Deanna Oliver. Starring: Bill Pullman, Christina Ricci, Malachi Pearson, Cathy Moriarty, Eric Idle, Ben Stein, Don Novello, Joe Nipote, Joe Alaskey, Brad Garrett, John Kassir, Amy Brenneman, Devon Sawa.